SKU: N/A. Category: Courses. Tags: aws certification training in bangalore, aws training in bangalore, best aws training in bangalore, learn aws online. 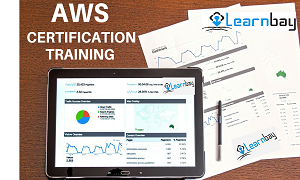 Learnbay provides the best AWS training in Bangalore with practical and hands-on project experience for freshers and working professionals. Our Amazon Web Services certification course curriculum is designed by industry experts which is more practical oriented and covers real-time use cases. We are one of the best AWS training institutes in Bangalore as we have instructors who are AWS certified and have 8+ years of experience in the domain. To make it easy for you to take up the AWS certification program, we provide weekend and weekdays options as well as the flexibility to attend the training online. Software developers,Project Managers,Software testing professionals. Anyone who has deep desire to learn AWS. We provide the best training, both in online and in classroom modes. Our AWS course in Bangalore has 60% theory and 40% hands-on practice assignment. We have classes on weekends and weekdays to provide maximum convenience for those who wish to learn AWS. The course will cover the fundamentals of designing highly available, fault-tolerant, and scalable and secured IT infrastructure on AWS platform. We also help candidates prepare for AWS Solution Architect certification in Bangalore. ï Application deployment management strategies such as rolling deployments and A/B. ï Version control, testing, build tools and bootstrapping. If you are keen about facing any technical interview with confidence or performing better in your current functional role, enroll in Learnbay, one of the best AWS training institutes in Bangalore. Contact us for more details.